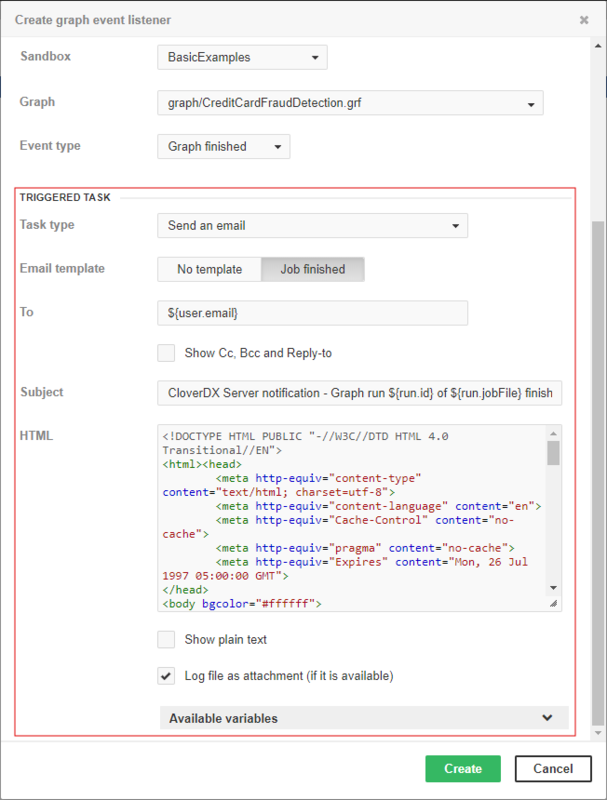 The send e-mail task is useful for notifications about a result of graph execution. For example, you can create a listener with this task type to be notified about each failure in the specified sandbox or a failure of the particular graph. This task is very useful, but for now only as a response for graph events. This feature is very powerful for monitoring. (for description of this task type, see Graph Event Listeners). Note: It seems useless to send emails periodically, but it may send current server status or daily summary. These features will be implemented in further versions. Task type "Send an email"
To The recipient's email address. It is possible to specify more addresses separated by a comma. It is also possible to use placeholders. For more information, see Placeholders. Cc Cc stands for 'carbon copy'. A copy of the email will be delivered to these addresses. It is possible to specify more addresses separated by a comma. It is also possible to use placeholders. For more information, see Placeholders. Bcc Bcc: stands for 'Blind carbon copy'. It is similar as Cc, but the others recipients aren't aware, that these recipients received a copy of the email. Reply-to (Sender) Email address of sender. It must be a valid address according to the SMTP server. It is also possible to use placeholders. For more information, see Placeholders. Subject An email subject. It is also possible to use placeholders. For more information, see Placeholders. HTML A body of the email in HTML. The email is created as multipart, so the HTML body should have a precedence. A plain text body is only for email clients which do not display HTML. It is also possible to use placeholders. For more information, see Placeholders. Text A body of the email in plain text. The email is created as multipart, so the HTML body should have a precedence. A plain text body is only for email clients which do not display HTML. It is also possible to use placeholders. For more information, see Placeholders. Log file as attachment If this switch is checked, the email will have an attachment with a packed log file of the related graph execution. Note: Do not forget to configure a connection to an SMTP server (see Part III, “Configuration”).